John Peter Altgeld (1847-1902) served as governor of Illinois from 1893-1897. Early in his term as governor, he was asked to review the sentences of the surviving prisoners convicted after the Haymarket affair. He saw that a great injustice had been done - four men hanged, three imprisoned for life on the flimsiest of evidence - and issued a pardon for the survivors. Public opinion was still against the prisoners, however, and this move effectively ended Altgeld's political career. The next year, during the Pullman strike, Altgeld refused to send in troops against the striking railway workers, and protested when President Cleveland defied his authority as governor and broke the strike. This resulted in as much public scorn as his pardon of the Haymarket prisoners. 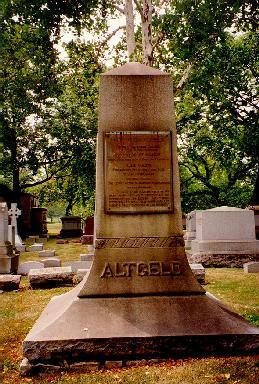 Altgeld's monument has bronze plaques inscribed with his words, from his public speeches as well as his document pardoning Fielden, Neebe, and Schwab. Villified and ridiculed at the time, Altgeld is now seen as one of Illinois' most upright and heroic politicians.